Indiabulls Enigma is one of the most exclusive lavish residential projects by Indiabulls Real Estate Ltd that is being developed in an equally premium locality of Gurgaon that is Sector 110. Catering to the cream of the crop, this project has incorporated only voluminous 4 and 5 BHK apartments where the 4 BHK is sized between 3400 to 3450 sq ft and the 5 BHK apartments are of 3780 sq ft and 7000 sq ft respectively. Sprawled over 15.6 acres of open area, this project features all of 10 blocks, each having 18 stories. These apartments are replete with ultra modern facilities that make it more appealing with a state of art clubhouse, gym, multipurpose hall, manicured garden with landscaped open areas, tight security, high-speed elevators, separate kids zone, and so on to name a few. The connectivity factor is extremely high in this case, as this project has access to all the potential hot spots in and around this area like the Dwarka Expressway, etc. It has plenty of schools like Euro kids, Gems International School, and so on within the range of 3 Km. Even banks and hospitals like HDFC bank ATM and Sneh Hospital respectively are conveniently located within walking distance. Shopping centers like the famous Ansal Plaza, PM mall, etc are all within the range of 2 Km thus saving on time and energy that would be otherwise wasted in traveling. These lavish towers are all set to outshine its competitors with its world-class design and lush green surroundings that create a serene atmosphere for its patrons. Indiabulls Enigma spread over 15.6 acres of land at Sector 110, Gurgaon offers luxurious 4BHK flats and 5BHK penthouses varying from 3350 square feet to 7430 square feet. 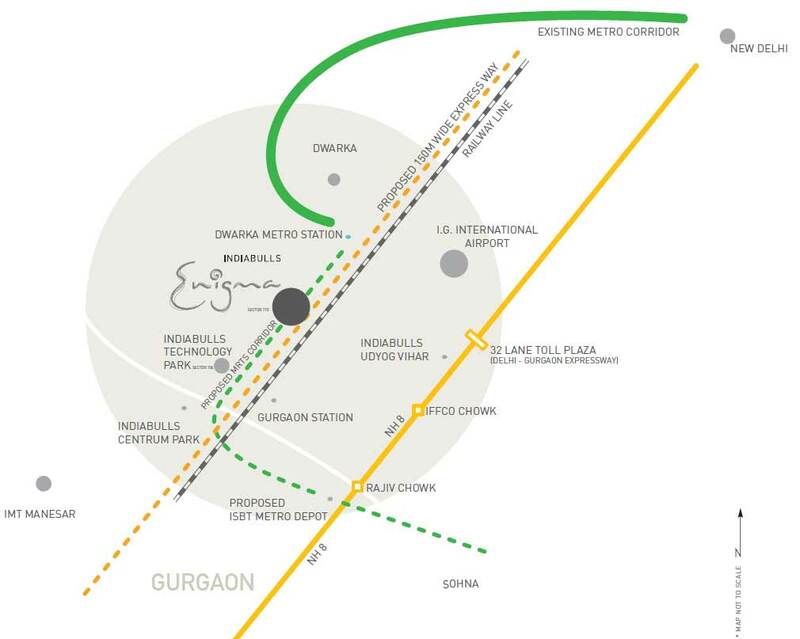 Indiabulls Enigma is located close to the International airport and is well connected to Dwarka, Palam Vihar, and NH-8 via the upcoming Dwarka-Manesar Expressway. This area is fast developing as the upscale locality with other high-end projects such as Sobha International City and Puri Diplomatic Greens in its vicinity. The apartment design ensures unobstructed views of the beautifully themed landscaped greens and abundance of natural light. Each apartment comes with energy efficient VRV air-conditioning, marble interiors, advanced security systems, gymnasium, spa, relaxation pool, yoga/aerobics studio etc. Current status: Apartments available both in original booking and resale. Possession expected around Dec 2014. 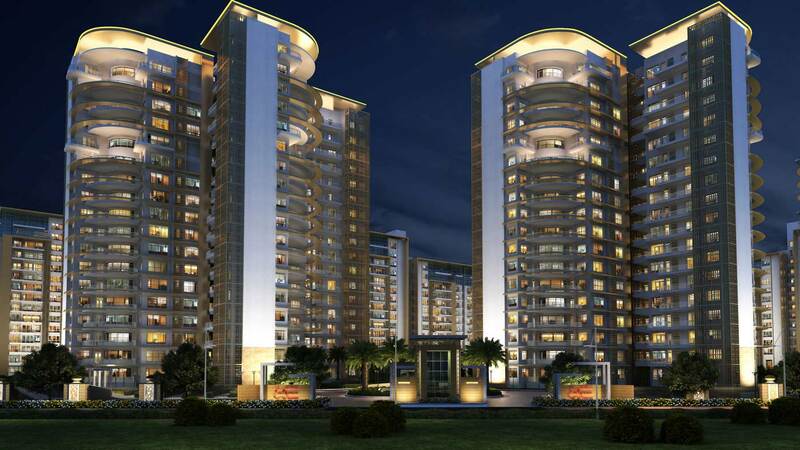 Indiabulls Real Estate Ltd has launched yet another Project in Gurgaon. 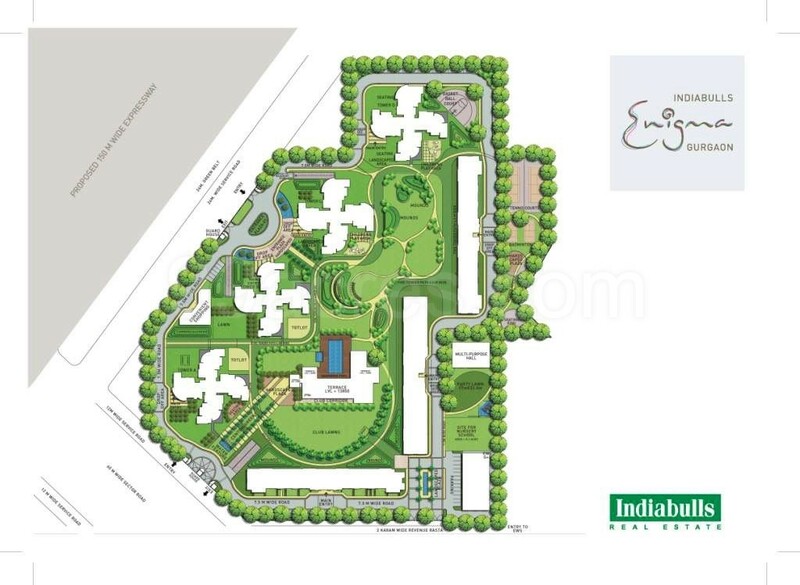 Indiabulls Enigma is located in Sector-110, Gurgaon, Haryana, INDIA. Indiabulls Enigma in sector 110, Gurgaon. 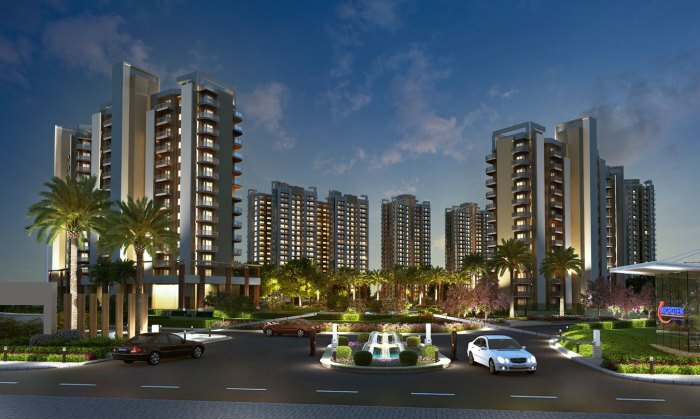 Indiabulls Enigma designed by renowned architect ARCOP is going to be Gurgaon’s new landmark residential complex. Spread over 15.6 acres of peace and tranquility, to cater to the demands of the elite league living, the master plan is a perfect blend of aesthetics, technology, human creativity and nature’s bounty. These residential towers have been meticulously crafted and tastefully designed keeping its residents' comfort & style in mind. The spacious 4 & 5 bedroom apartments starting from 3285 sqft and penthouses are bestowed with all modern age facilities and ample natural daylight to balance the best of both.